I want to teach this book so that I know that people are reading it. 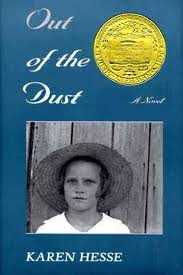 I've avoided Out of the Dust for awhile, mostly because of the boring cover (I'm that girl) and that it won the Newbery Medal in 1998 and I don't usually love Newbery winners (I'm that girl, too.) When I started researching novels in verse, Karen Hesse's classic kept coming up. I tried it out and am so glad I did. Out of the Dust sticks with you. Billie Jo Kelby and her family live in Oklahoma during the dust bowl years of the Great Depression. People are starving, farms are folding, and many are fleeing west to escape the poverty of the Dust Bowl. After three years without a strong crop, the Kelby's economic situation continues to deteriorate. When a horrific tragedy strikes (I gasped. Anyone who has read this book knows the scene I am talking about. ), they are emotionally and physically destroyed. Grit is the word that comes to mind. Billie Jo has the grit to continue on after her world has been shattered. Her bravery and resilience are moving; I wanted to scoop her up and comfort her. Grit also has a literal meaning in the novel, with dust infiltrating every aspect of their lives. I never thought about having to keep glasses and dishes turned over while setting the table, nor what it was like for students to take a test in a dust storm. Hesse's imagery works the dust into the reader's mind until they, like Billie Jo, just want to escape to a cleaner, happier place. Out of the Dust is impossibly sad, which is why the free verse format works so well. The reader is able to move through the book at a quick enough pace that the events aren't too depressing. Plus, the spare writing is a perfect fit for the setting, flowery prose just wouldn't work on an Oklahoma farm where there are never enough hours in a day. Billie Jo's story will remain with me and has given my understanding of the Great Depression a new, more personal, dimension. I listened to the audio version of this one. I don't remember who read it, but she captured the voice of Billie Jo perfectly. I've always avoided this one too, for the first reason you mentioned, and also because I thought of it as a book on the school reading list (another reason it must be boring). My experience with The Old Man and the Sea gave me major doubts about that list! However, a lot of people have been telling me this is their favorite novel in verse, so I'm tempted to finally bite the bullet and give it a try. Definitely try it. I am a teacher and I hate school reading lists! I actually have this one here at home, yet I keep passing over it. I think you're right, it's that boring cover! But you've convinced me - I'm going to finally give it a try. I look forward to hearing what you think. Everyone is deterred by that cover. If I ever teach it, I am going to put a brown bag over the covers and let students design their own.